Home Uncategorized CityDig: A Panoramic View of 1877 L.A.
CityDig: A Panoramic View of 1877 L.A. 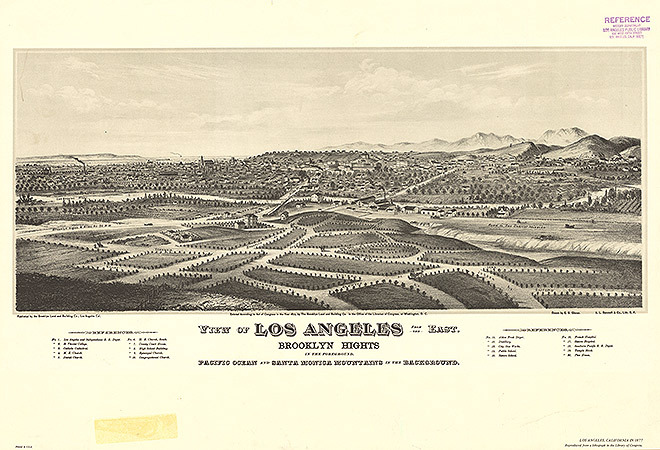 Imagine our city of Los Angeles when most of the modern metropolis was brand spanking new, then realize that image in this fine panoramic map created in the landmark year of 1877. Panoramic maps of urban centers were unique to North America in the Victorian era but were influenced by the “perspective mapping” that was done in Europe in the 19th century. Eli S. Glover was one of the first to draw the settlements on the West Coast, and he did two very fine maps of Los Angeles that enticed folks to visit the City of Angels. Scale and accuracy were never top priorities for Glover, as evidenced by the nearby Pacific Ocean and Santa Monica mountains that appear to be just outside the city limits. Typically, panoramic maps show existing landscapes and structures as well as planned developments, like the soon-to-be constructed “Brooklyn Heights,” which was being put together by a group of investors called the Brooklyn Land and Building Company. Apparently, Glover saw this map as an economic opportunity; as a hired gun of the BLBC, he drew Brooklyn Heights into the landscape and subsequently received several acres in return for his services (which may have added to his inspiration for this cartographical beauty). East Los Angeles had been founded in 1873 and Boyle Heights in 1876, so that side of the river was filled with many familiar streets and the heart-shaped Prospect Park that still exists to this day. This map was released at the end of a mini-depression, and a population boom was stirring in the dusty streets of the old pueblo. The unusual perspective, which looks east from across the Los Angeles River, gives us a remarkable view of a city of 10,000 people that would quadruple in size over the next decade. Many of the landmarks listed were new, some just built in the quickly spreading American city. One reason for the growth that would occur in the years after this map’s creation was the Southern Pacific Railroad Depot, known then as the “River Station,” where the new arrivals would disembark (see the upper right, where our “cornfields” now exist.) Visible also is St. Vincent’s College, where the “fathers of the congregation of the mission facility” taught Angelenos who, in order to enroll, were required to be “over 10 years of age.” The brand new St. Vibiana’s Cathedral (1876) is visible at 2nd and Main and a “Jewish church” (Bnai B’rth Synagogue) opened in 1862 on Broadway between 2nd and 3rd. The magnificent two-story Los Angeles High School is high up on Poundcake Hill, where the first seven students graduated two years prior to this map’s creation. There is also Saint Athanasius, the Episcopal church, the Sisters Hospital (which later became St. Vincent’s), the old County Court House, and the French Hospital founded at College and Hill in 1869. Also of great importance is the Macy Street covered bridge, which local vintners demanded be built after a load of their grapes fermented in wagons stuck in the mud of the river after a rain. Appropriately, right next to the bridge is a distillery where spirits were created to bolster the resolve of the citizens of Los Angeles. God Bless ‘em.